Show the rock climber in your life your support with this playful print. 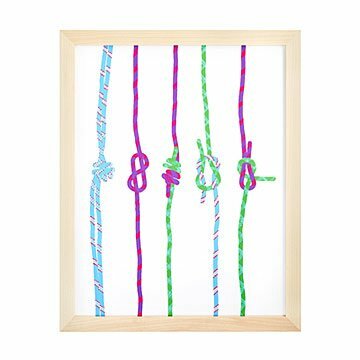 Show the rock climber in your life your support with this playful print of the ties that bind them to the mighty mountain. Illustrator and children's book author Jorey Hurley finds endless inspiration in life's extraordinary ordinary moments and creates a drawing every day based on her encounters, including this scene. These cords are expertly cinched using five intricate knot patterns that help the climber ascent to new heights on every bouldering adventure. Characterized by rich, flat colors and stylized subjects, her vibrant, blocky images show the influence of her work in textile design. Printed on matte heavyweight cold press paper with archival inks. Made in Oregon. Framed: 15" H x 12" W, Print: 14" H x 11 W"